The study of English is an astonishingly rich and varied field. English spans history, from the Middle Ages to the present day. It spans geography, taking on different shapes in English-speaking cultures around the world. And it encompasses a wide array of genres, including poetry and prose, journalism and drama, theory and criticism, and even new media. As an English major, in addition to becoming literate in one of the world's richest literary traditions and understanding the history that has shaped English-speaking cultures, you'll acquire valuable skills. You will learn how to read carefully and closely, write skillfully and stylishly, and argue analytically and persuasively. Such highly sought-after abilities will stand you in good stead no matter what path you choose, whether it's pursuing advanced study in English or seeking a job in education, business, law, television, film, politics, psychology, writing, social activism or any number of fields. The English department faculty are world class and diverse. They bring to the classroom a wide array of perspectives and specialties, such as African and Afro-American studies, film, television and interactive media studies, Anglophone studies, and women's, gender and sexuality studies. Their courses range from the origins of English literature, to Anglophone literature in its global context, to contemporary bestsellers and new media. Popular areas of focus for students in our department are women's studies, gender and sexuality, modern American literature, Anglophone literature and postcolonial theory, early modern (especially Renaissance) English literature, literature and science, literary theory and philosophy, and contemporary poetry. Our faculty are also dedicated teachers and mentors. As an English major, you will work one-on-one with your adviser to determine your best course of study. And the English major is extremely flexible, enabling you to tailor your selection of courses to wherever your passions lie in terms of history, geography and genre. Our department is also very active, sponsoring readings and guest lectures on a regular basis. If you are planning a career in English, you may wish to undertake the intensive, focused experience of writing a one-semester senior essay or a two-semester senior thesis. Brandeis offers a wealth of resources for English majors, as do the numerous other universities, museums and other cultural institutions of nearby Boston. Ramie Targoff, the recipient of a Guggenheim fellowship, recently was awarded an honorable mention for the Modern Language Association's James Russell Lowell Prize. Writer-in-residence Michelle Hoover's novel "Bottomland" was selected as the All Iowa Reads title for 2017. Ulka Anjaria recently received an ACLS/Charles A. Ryskamp Research Fellowship as well as a Mandel Faculty Grant in the Humanities. Dawn Skorczewski recently received a CLUE+ Research Fellowship at VU Amsterdam. Recent faculty publications include John Plotz's "Semi-Detatched," Ramie Targoff's "Renaissance Women: The Life of Vittoria Colonna," David Sherman’s "In a Strange Room: Modernism's Corpses and Mortal Obligation," Olga Broumas's "Jamais Vu" and Laura Quinney's "New Ghosts." Many of our undergraduate alumni go on to pursue a master's or doctoral degree in English, often becoming professors, secondary education teachers, and authors. Others pursue careers in publishing, business, law, entertainment, government and public service. English department alumni include Deborah Bial ’87, founder and president of the Posse Foundation, an education access nonprofit; Michael Ratner ’65, president of the Center for Constitutional Rights in New York City; Marshall Herskovitz ’73, a director, producer and screenwriter whose work includes "The Last Samurai" and "Traffic"; and Margo Jefferson ’68, a Pulitzer Prize-winning critic-at-large for The New York Times. You might choose the English minor to complement a major in anthropology, comparative literature, education studies or another field. See the requirements for the minor in the University Bulletin. Contact Professor William Flesch to learn more about how the English curriculum is structured and what you would need to do to major in this field. His office hours are listed here. 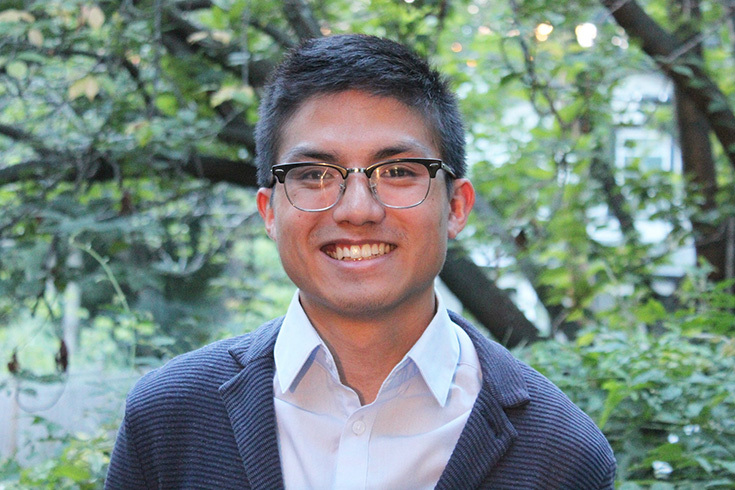 Dan Truong parlayed a summer internship in the communications office of Massachusetts Treasurer Deborah Goldberg into a job as the assistant director of communications.